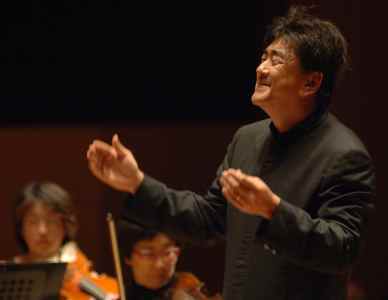 Critics have unanimously hailed Yutaka Sado as one of the most enthralling and charismatic conductors of the new generation. Highlights of the 2011/12 Season include the 12-city tour of Deutsches Symphonie-Orchester Berlin in Japan in the fall, and return to his long-time collaborators; Orchestre de Paris, the Orchestre de la Suisse-Romande, BBC Philharmonic, Konzerthausorchester Berlin and Filarmonica '900 del Teatro Regio di Torino. In the 2010/11 Season Sado has made his successful debut with the Berlin Philharmonic and the Bavarian State Orchestra. Furthermore, he has conducted Mahler’s Third Symphony with the Mahler Chamber Orchestra in a coproduction with the Hyogo Performing Arts Center Orchestra in Hyogo, Japan. The long-time assistant of Leonard Bernstein and Seiji Ozawa was awarded the most important conductor's prizes, e.g. the Premier Grand Prix at the 39th International Conducting Competition in Besançon and the Grand Prix du Concours International L. Bernstein Jerusalem. Sado's strong ties to Leonard Bernstein lead him to Bernstein's Pacific Music Festival in Sapporo as 'conductor in residence.' He also had the privilege to participate in the Leonard Bernstein Memorial Concert at the Cathedral Church of St. John the Divine in New York. Since 2005 Yutaka Sado is the Artistic Director of the Hyogo Performing Arts Center (HPAC) and of the HPAC's resident orchestra. The concert hall has become one of the most important concert halls in Japan with approximately 70.000 subscribers. Sado's degree of popularity in Japan is tremendous, especially due to his appearance as conductor and main host in the Untitled Concert, the weekly TV program which was honored the longest running TV program for classical music by the Guinness World Records. Next to Japan Yutaka Sado's career particularly developed in France, first of all, where he was appointed Principal Conductor of the Orchestre Lamoureux in October 1993. Yutaka Sado has been one of the favorite conductors of the Orchestre de Paris, the Orchestre Philharmonique de Radio France and the other major French orchestras for many years. He possibly is the only conductor who managed to conduct all 'Big Four' orchestras in Paris in one season. In Germany, a close collaboration with the DSO Berlin has developed in recent years. Alongside Sado has been guest conducting major German orchestras including the Sinfonieorchester des Bayerischen Rundfunks München, the Staatskapelle Dresden, the Gewandhausorchester Leipzig, the Konzerthausorchester Berlin, the Radio Symphony Orchestras in Cologne (WDR), Stuttgart and Freiburg (SWR) and the Gürzenich Orchestra, the Frankfurter Museumsorchester, the Bamberg and Düsseldorf Symphony and the Dresden and Hamburg Philharmonic. In Italy he conducts the orchestras of Santa Cecilia Rome, RAI Torino Orchestra, the Verdi-Symphony Orchestra Mailand and the orchestra of the Maggio Musicale in Florence. In 2010 Sado made his Italian opera debut with Willy Decker's production of Britten's PETER GRIMES at the Teatro Regio di Torino. In Switzerland he conducts the Tonhalle-Orchestra Zurich and the Orchestre de la Suisse-Romande, in the UK the BBC Philharmonic and the London Philharmonic Orchestra. CD-productions of Yutaka Sado and the DSO Berlin comprise recordings for AVEX with Tchaikovsky's Symphony No. 5 and Rachmaninoff's Second Piano Concerto with the Japanese pianist Nobuyuki Tsuji. Sado and Tsujii also produced the Tchaikovsky’s Piano Concerto with BBC Philharmonic. With the Orchestre Lamoureux he recorded music by Jacques Ibert (Naxos), by Ravel and Chabrier (Erato/Warner) and by Satie (Erato). Yutaka Sado made three exclusive recordings with the Orchestre Philharmonique de Radio France - the first devoted to French repertoire (by Dukas, Bizet, Offenbach), the second to the works of Leonard Bernstein (including Symphony N° 3 Kaddish and the Chichester Psalms with Karita Mattila and Lord Yehudi Menuhin as narrator) and the third one featuring works by Berlioz, Liszt and Wagner. Furthermore, he recorded opera arias with Karita Mattila and the London Philharmonic Orchestra (Erato-Warner).